Happy New Year and Most Read Posts of 2018! I would like to wish our readers a very Happy 2019! Before we close out 2018, I would like to set out our most read posts of the year. These give a snapshot of the some of the key developments in international law over the course of the year, and/or of key incidents in international affairs with consequences for international law. The top 10 posts are presented here with the numbers 11 to 20 below the fold. The planetary boundary framework was originally developed to identify the key global processes that are essential for regulating the functioning of the Earth System and create what are effectively safe ‘buffer zones’ that might prevent humanity from crossing dangerous biophysical thresholds or tipping points. In its current version, the framework describes nine such boundaries, ranging from climate change to atmospheric aerosol loading and including freshwater use, land-use change, stratospheric ozone depletion, introduction of novel entities to the environment, ocean acidification, biogeochemical flows and, crucially, biosphere integrity. The fact that the boundaries represent the limits of what the authors call the ‘safe operating space’ for human development on a changing planet has attracted immediate interest from political scientists working on Earth System governance, and some legal scholars have progressively started to consider the concept as potentially useful for international environmental law as well. Ever since the first elaboration of the nine planetary boundaries, the very possibility of identifying a global boundary for biosphere integrity resulting from changes in regional and local biodiversity has appeared as one of the most contentious aspects of the framework. As a result of intensive discussions to which various research communities contributed, the description contained in the original planetary boundaries paper was in fact updated in 2015,in order to capture the two key roles of the biosphere in the Earth System, and namely: (a) the importance of genetic diversity in maintaining and building its resilience (i.e. through the use of global extinction rates); and (b) the contribution of organisms’ functional traits to Earth System functioning (i.e. through the so-called Biodiversity Intactness Index). In doing so, the planetary boundary framework was also expanded to recognize the importance of sub-global boundaries that must align with the global boundary definition for biosphere integrity, owing to the fact that the ideal unit of analysis for changes in elements of biodiversity is usually situated at the level of biomes and ecosystems. From this perspective, and subject to further scientific advancements and new data becoming available, a planetary boundary for biosphere integrity could potentially represent a very useful tool for international biodiversity law. On the one hand, because the national allocation of the planetary ‘safe operating space’ would recognize and make explicit the above-mentioned link between a global boundary and the regional, national and sub-national operating scales at which biodiversity loss occurs. On the other, and as a consequence, because the incorporation in international biodiversity law of a global boundary that might be quantifiable through critical values for one or more control variables could in theory enable changes to biosphere integrity to be used as an indicator of State responsibility, providing a powerful empirical benchmark against which to assess the respect of legal obligations relating to biodiversity (or, at the very least, a set of more precise, science-based objectives and targets that it would be more difficult for States to ignore). For the purpose of the present analysis, it is less important what the control variables should be, and it should indeed be noted that identifying suitable ones for biosphere integrity remains a daunting and still hotly debated task. What is crucial is that the concept of a measurable planetary boundary for biosphere integrity clearly suggests that the related biophysical limits, once incorporated in international law, could play an important role in mitigating the procedural and/or non-enforceable nature of most international obligations relating to biodiversity within national jurisdiction (for example, the requirement to develop national strategies, plans or programmes for the conservation and sustainable use of biodiversity set in Article 6(a) of the CBD, or the obligations for in-situ conservation listed in Article 8). The recent publication of the UN Secretary-General’s Report on ‘Gaps in International Environmental Law’ comes at a particularly critical juncture for the protection of the world’s biodiversity. The Report was released just days after the conclusion of the 14thConference of the Parties to the Convention on Biological Diversity (CBD), which has expressed deep concern about countries’ lack of progress in the achievement of the Convention’s Aichi Biodiversity Targets by 2020. Furthermore, it closely follows a number of other urgent calls for action, including those contained in WWF’s Living Planet Report and in the four bleak regional assessments conducted by the Intergovernmental Panel on Biodiversity and Ecosystem Services (IPBES). The widely anticipated failure of the CBD’s Strategic Plan for Biodiversity 2011-2020 has been used as a starting point by some to advocate for a renewed ‘global deal for nature’. The Gaps Report itself, beyond its endorsement of a future Global Pact for the Environment, is especially scathing in its ‘indictment’ of biodiversity-related instruments in international law. The Report builds on years of scholarly debates in this field and focuses on, inter alia, the absence of a coherent structure of international biodiversity law, the lack of binding commitments and poor national implementation of voluntary ones, inadequate integration of biodiversity into other law- and policy-making arenas, insufficient use of ecosystem-based approaches to conservation, and lack of attention paid to interconnectedness of ecosystems within and outside protected areas. Recognizing the need for innovative legal instruments that can capture the complexity of ecological relationships and mitigate the pervasiveness of anthropogenic interference on the Earth’s biodiversity, the international community has indeed embarked on the preparation of a post-2020 global biodiversity framework, as well as on the negotiation of a new treaty applying to biodiversity beyond national jurisdiction. What is arguably missing in both the Gaps Report and these wider intergovernmental efforts, however, is a thorough analysis of the underlying reasons that have prevented existing international biodiversity law from being effective in curbing global extinction rates and unsustainable patterns of ecosystem destruction and degradation, despite decades of legal developments and a robust apparatus of subsidiary bodies tasked with providing scientific and technical advice. Without a similar analysis, the risk of future biodiversity regimes falling back on business-as-usual approaches will probably remain very high. In this post, I first describe one particularly problematic aspect of international biodiversity law, namely the difficulty of identifying substantive obligations (i.e. obligations of result) applying to biodiversity located within national jurisdiction despite increasing awareness about the interconnectedness of ecological processes occurring at different spatial scales. 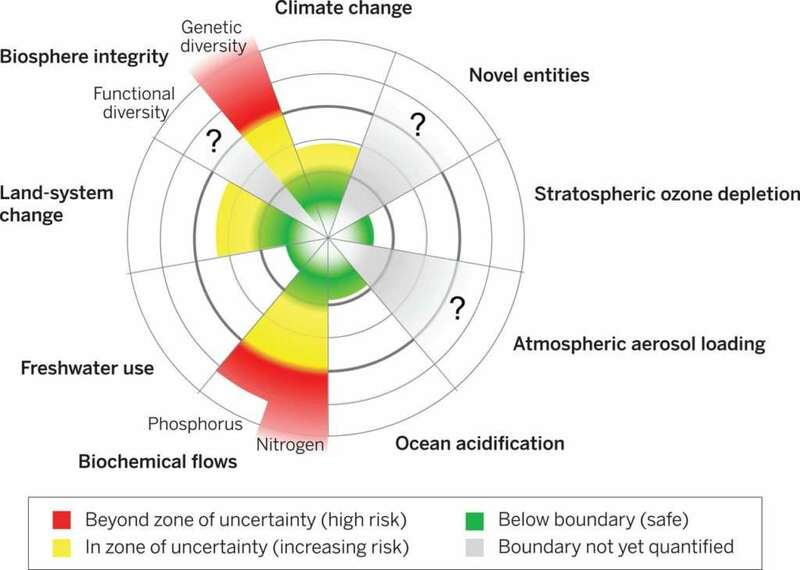 Secondly, I suggest the potential of the planetary boundaries framework first developed in 2009 by Rockström and others to provide quantifiable measures of ‘biosphere integrity’ that can help define these international obligations. Finally, I propose four ways in which international biodiversity law (including its institutional arrangements) could be used to incorporate a planetary boundary for biosphere integrity. Headlines recently announced the end of a critical climate summit in Katowice, Poland. Katowice had played host to the 24thConference of the Parties meeting (COP24) under the United Nations Framework Convention on Climate Change (UNFCCC). The summit was billed as a “make or break” moment for the world community. Three years had passed after world leaders emerged from climate negotiations in France with the Paris Agreement. After the initial euphoria wore off, reality set in that while climate change was accelerating, mitigation efforts under the Paris Agreement were falling behind schedule. And the city of Paris itself has become a powerful symbol for the difficulties faced by the Katowice negotiators. Three short years after being the cradle of a new hope, French measures to implement the Paris Agreement gave rise to the Yellow Vest protests. These protests eventually laid siege to the city of Paris itself. The picture that emerged: the Arc de Triomphe engulfed in smokeas a signature policy initiative by the French government to implement the Paris Agreement went up in flames. So – how successful was COP24? Did it succeed in rescuing the Paris Agreement? Or is Paris in ruins? Editor’s note: Continuing a tradition started by Isabel Feichtner a few years ago, EJIL’s Review Editor, Christian J. Tams, invited members of the EJIL board to offer short reflections on their favourite books of the year 2018. In the following days we will present some selections here on EJIL:Talk! They comprise a wide range of books, from (a few) doctrinal legal texts, to (many more) historical accounts and works of fiction. Unlike in many official book prize competitions, 2018 does not necessarily stand for the year of publication; rather, board members were asked to list books they read or re-read this year, and found inspiring or enjoyable. Today we give you Diane Desierto’s favourites. Why do we have a global economy, what is it for, what comprises it, and to what ends and purposes do we regulate it? Somewhat unconsciously, my favourite books for 2018 directly or indirectly related to these questions. Throughout 2018, I relished reading (or rereading, in some of these) Hersch Lauterpacht’s classic International Law and Human Rights (F.A. Praeger Press, 1950), followed by Louis Meuleman’s Metagovernance for Sustainability: A Framework for Implementing the Sustainable Development Goals (Routledge, 2018); David Pilling’s The Growth Delusion: Wealth, Poverty, and the Well-Being of Nations (Bloomsbury Publishing, 2018), Mariana Mazzucato’s The Value of Everything: Making and Taking in the Global Economy (Penguin Random House UK, 2018), and Francis Fukuyama’s Identity: The Demand for Dignity and the Politics of Resentment (Farrar, Straus, and Giroux, 2018). These books proved illuminating this year in my ongoing thematic and granular search for answers to the above questions. Last week the European Court of Human Rights published a press release which is worth flagging for readers, with an update on litigation concerning various aspects of the conflict in Ukraine pending before it. As things stand, there are more than 4000 individual cases before the Court with a nexus to the conflict, whether in Eastern Ukraine or Crimea. There are currently five pending interstate cases between Ukraine and Russia, the latest one filed in November, concerning the Kerch Strait incident (see this prior post by James Kraska) and in which the Court has indicted interim measures. The Court has now decided to adjourn many of the individual cases, pending its decision in the interstate cases on the applicability of the Convention, specifically with regard to the Article 1 ECHR jurisdiction of both Ukraine and Russia; for a discussion of this issue, see my recent ICLQ article with Tatjana Papic on the applicability of the ECHR in contested territories. The full press release is reproduced below. 1. Call for Abstracts: Constitutional Court Review. The editors of the Constitutional Court Review are issuing an open call for abstracts and articles for the Constitutional Court Review X (2019). The Constitutional Court Review is the only internationally accredited journal on the work of South Africa’s Highest Court. The Constitutional Court Review Conference/Workshop allows authors and editors to read one another’s work and engage initial drafts in an intimate environment. For those persons unfamiliar with the journal, please see here to view all eight published volumes and find out a little more on who we are and what we do. CCR I through CCR VIII are online, open access and freely downloadable. (CCR IX will be housed online in 2019.) The journal is also freely available on SAFLII (the Southern African Legal Information Institute database), and can be accessed through Heinonline and Sabinet. 2. New Additions to the UN Audiovisual Library of International Law. The Codification Division of the Office of Legal Affairs recently added the following lectures to the Lecture Series of the United Nations Audiovisual Library of International Law (AVL) website: Ms. Patrícia Galvão Teles on “Obligations and Rights Erga Omnes in the case-law of the International Court of Justice” and Mr. Ki-Gab Park on “Lex Ferenda in International Law”. The UN Audiovisual Library of International Law provides high quality international law training and research materials to users around the world free of charge. 3. Call for Researchers: Global Study on the Impact of the UN Human Rights Treaty System on the Domestic Level. The UN human right treaty system is widely believed to be at the core of the international human rights project. But exactly what evidence is available to demonstrate its impact on the lives of people worldwide? Moreover, what are the factors that enhance or inhibit its effect where it matters – on the ground? Two decades ago, a group of researchers based in twenty countries engaged in the most comprehensive attempt thus far to to answer these questions. The study leaders were Christof Heyns and Frans Viljoen from the the Centre for Human Rights, University of Pretoria, working with the UN Office of the High Commissioner for Human Rights. They have now again assembled a group of researchers based in the same twenty countries. Using the earlier study as a base-line, they are asking where are we today, and how should we approach the future. Yet in spite of its geographical and temporal scope, this study will reveal only part of the picture, and it will date soon. What is needed is global, ongoing academic engagement with the treaty system. Researchers worldwide are encouraged to undertake independent research on the same topic in their home countries and to publish it in academic journals of their choice, making sure the treaty system enjoys the benefit of rigorous – and most importantly, locally based – academic engagement. See here. In 2018, the international legal world as we know it has faced deep and significant challenges, including the attack on democracies and the rise of authoritarianism, the preference of both the American and Chinese governments for bilateralism over multilateralism or the destabilizing of global economic institutions. How and what does one read at a time like this? Most of the books I survey here revisit the history of the postwar moment and its hopes for a future that is now our present. It may not be surprising that in this moment of bewilderment we return to history and early beginnings, searching for answers. We look for parallels in the past. We look more closely at the key architects of international law and how their ideas shaped (or not) the legal reality over time. We examine whose ideas took prominence and why. We search for the roads not taken. This is by no means a comprehensive list for such an inquiry, but I hope that reading these books may offer some important clues in working with these questions.